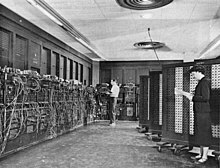 Epitolia et redentes ad ENIAC programmandum adhibebantur (1946). Charta perforata programmate initiali pro IBM 1130 (1965) puncta. Consola IBM System/3 ex annis 1970. Initiatio systematis in computatione est initiatio systematis computatralis. Quod systema computatrum et instrumentum computatrale esse potest. Ratio initializationis frigida (initiatio e frigido) vel calida (initiatio e calido) esse potest. ↑ Vocabula computatralia. Anglice booting et booting up. Vicimedia Communia plura habent quae ad initiationem systematis spectant. Practical boot loader tutorial for ATmega microcontrollers. Booting with GRUB. OSDEV Community, 4 Maii, ex prima editione, 10 Februarii 2007. Tutorial on writing hello world boot loader. Code of a simple boot loader for students. Novissima mutatio die 19 Novembris 2017 hora 23:30 facta.